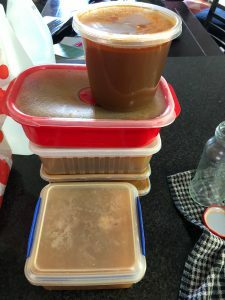 A great LowSodium chicken stock recipe you can freeze and use at will. Collect all your carrot, celery, leek, onion, cabbage and turnip type scraps for a few weeks till you hit around the 2kg mark. NO POTATO skins! Add scraps, herbs and chicken frames to a large stock pot then add in 10 – 15 litres of water and simmer gently for 2 – 4 hours, adding more water and herbs to taste as you go.